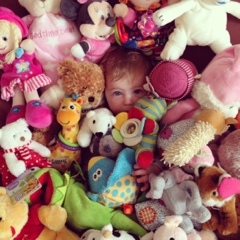 Can you find her? Can you? I know it seems impossible but if you do that squinty-eye-thing like with those magic eye pictures it will make no difference whatsoever (just like with the magic eye pictures). For the few sharp-eyed folk who do spot her instantly this week’s prize is almost too awesome to comprehend…. I grant you one hours smugness. Use it wisely – prank call your mother-in-law, send abusive emails to your child-less friends, tell-off a pensioner or perhaps just kick a stranger. This is my gift to you. hahha!! Awesome capture! Visiting you while bloghopping. Do visit my blog when you get a chance! Gorgeous! Well worth an hour of your life!